Sunsets in Florida tend to be beautiful, but on the east coast by Jupiter and Palm Beach they aren't always in the most convenient place: looking west usually means the sunset is interrupted by power lines and skylines. 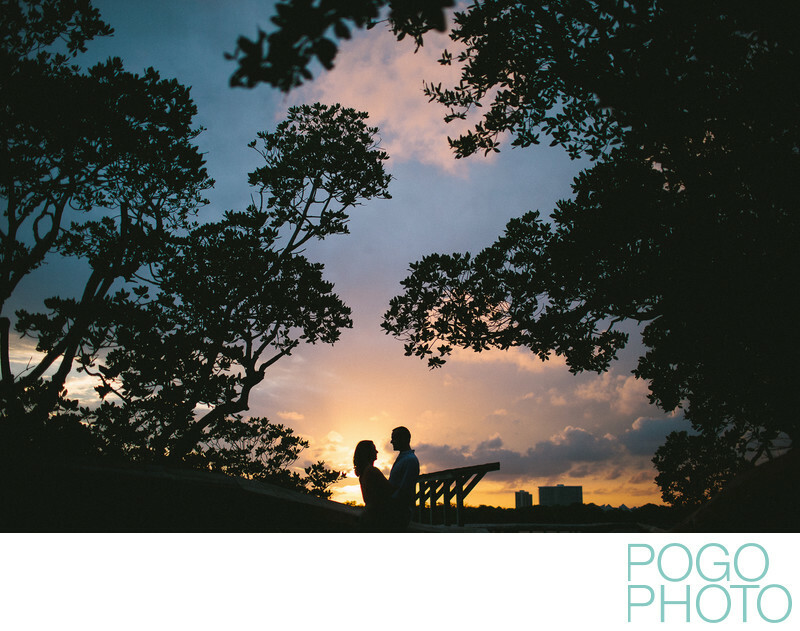 This location on Singer Island allowed us to use the framing trees to create interest around the pictured couple, and the cropping and position we chose for this shot keeps it feeling like a beautiful landscape image that the couple happens to be in. The pinks, oranges, peaches, purples, and indigos of the setting sun contrast sharply with the black tree outlines, making for a striking image. We love photographing sessions at MacArthur Beach State Park because of the vast variety of backgrounds. Nowhere else is quite like this park: wide open vistas, pristine sandy beaches, crashing waves, raw driftwood, tree canopies with sparkling sunshine the finds even the darkest corners of the woods, meandering pathways through woods and dunes, and even kayaking in the shallow river waters. This park has a true feel of old world Florida; sure, air conditioning is nice, and we all love shopping and dining, but the great outdoors is accessible year round in this state, so we recommend getting out there and experiencing it. Location: MacArthur Beach State Park, Singer Island, Florida. 1/4000; f/1.6; ISO 400; 35.0 mm.